When I say, "I hate Romeo and Juliet", I really do mean I hate it. If you were to ask me what my opinion of the play was, this is probably what you would hear. It would be loud! Romeo and Juliet is a fantastic example of what Shakespeare is capable of when he only writes for his audience. No one is going to object for one second if a playwright fulfils a need that audiences have. It is, after all, a lot about numbers and about being seen as successful so you can move to your next project. A lot of people confuse being successful with being greedy or money driven but I generally bite my thumb at such people (see what I did there?) But no, I think the term successful can mean so many things and for different people its measured in radically diverse ways. For theatre its all about bums on seats and you are not going to get another play to run if no one notices or comes to watch what you produce. So, my issue with Romeo and Juliet isn't that its popularist tripe is that it's JUST popularist tripe. Think of all the great Shakespearean speeches, you know the ones? The beautiful nuance and emotional pleading Portia uses to entreat for her loves life in The Merchant Of Venice. Or the powerful and threatening pre murderistic intent conveyed by Lady Macbeth before she murders Duncan. I could go on but surely you get my point. What do we get in Romeo and Juliet? "But soft, what light through yonder window breaks? It is the east, and Juliet is the sun. That thou, her maid, art far more fair than she." That's about the level we reach, its not especially high is it? I know Romeo and Juliet lovers that will swoon over this sort of stuff but it makes me want to vomit. Don't even try and accuse me of not being romantic either, I really am, but I want a bit more when I go and watch the Bard at play. Actually no, I expect a lot more because I get it with all of his other plays. Then there is the actual storyline and characters themselves... I say storyline as if there actually is one. There isn't, we are told exactly what is going to happen right at the commencement of the play. Romeo and Juliet are from two warring families and they fall in love and it doesn't go too well, so they die. That's it? Yawn. Yes, I know there is an amusing sub plot involving some dippy County called Paris wooing Juliet and yes I know that Mercutio's pratting around is wonderfully amusing but that really is all Romeo and Juliet is about. They fall in love, they marry, they die, swoon, so tragic! Romeo is the sort of idiotic, silly boy that needs to have a word with himself. So distracted at his lack of returned love, (he's been spurned don't you know? ), that he fails to see what's going to inevitably happen if he pursues his lust for Juliet. Yes it is lust, "Is that all I get," cries he when she rewards his amour with only sickly sweet sentiment. But Juliet's character is the killer for me. 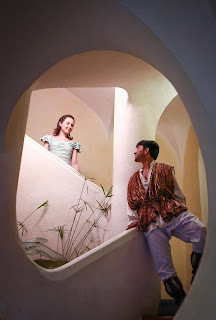 All previous performances I have ever endured have portrayed her as a silly, stupid girl who falls head over heels for the first boy that ever sighed over her. I don't see the inference that Juliet is stupid or slow witted in the text at all and Baz Luhrmann's crassly poor cinematic modernisation of the play did nothing to change my mind. So, as the house lights dim and I settle back to endure another two hours of simpletons going on about banishment, I ponder to myself what it would be like if a production of Romeo and Juliet managed to engage with me to such an extent that I enjoyed the experience. Wow! It's happened and so here is my first ever review of Romeo and Juliet, the production that I actually enjoyed. As with their production of The Tempest, PerformInternational have staged Romeo and Juliet in a stripped back and minimalistic format that really appeals to me. I am sure that the West End, Kenneth Branagh, version is all flash bang and spectacle but that, for me, misses the point. It's not about impressive staging and it's not about big, it's about Bard! As the assembling slaves and support cast set the scene in "fair Verona" I would like to say that I knew this would be different to other productions and that, right from the outset, I knew this would be a performance that would change my mind about Romeo and Juliet. This would be a lie, my hope was that PerformInternational, having shown a masterly understanding of Shakespeare in The Tempest, would deliver a play that was not treading the familiar boards of what had gone before. The play's opening fight sequence is absolutely critical in that it conveys powerfully the Montague and Capulet hatred in a profound way. If a staged fight is not handled correctly this can be an embarrassment to watch as actors pretend to kill each other with much gusto and clashing of plastic swordage. Not so here! Ted Duran, who is also captivating as Benvolio, clearly knows his art and has crafted a brilliant and exhilarating fight sequence which was hugely exciting. Alexander Berry is commanding and unbending as the ruling Prince, who is desperate to prevent more bloodshed, and his ultimate sanction of death is conveyed with such powerful necessity that you almost feel sorry for him. 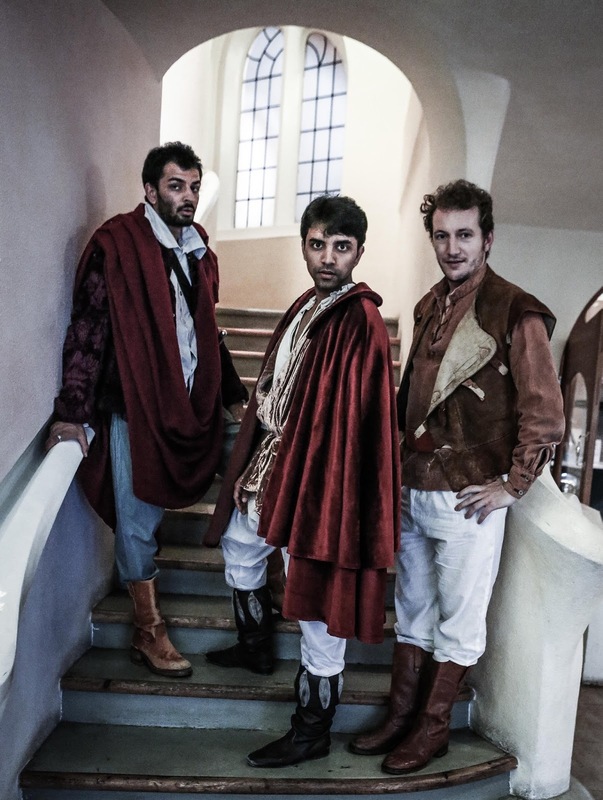 Nicholas Pimpare steals every scene he is in as Mercutio and his word play and banter with Benvolio have never sparkled and engaged more effectively. His final curses to both Capulet and Montague houses reverberate with such force that they sent a shiver up and down my spine. Not so much shouted but spat out as if to call for his own death to be avenged. As I ranted about earlier, any performance of Romeo and Juliet stands or falls by the portrayal of the titular characters and it would not matter how tremendous the performance of the supporting actors. Get this wrong and you are lost and I would be writing a very different review. I thoroughly enjoyed Manish Srivastava's portrayal of Caliban in The Tempest so was looking forward to how he was going to bring Romeo to life. His portrayal of the star crossed lover is contemplative and passionate but with an urgency as well. His life view is simple, if you don't have love you are lost, and the scenes when he contemplates his banishment without Juliet are absolutely astounding. You could feel his torment and his body writhing in emotional agony as he sobbed on the floor showcased the sheer talent of Srivastava, this guy can act! Here too was vulnerability and the sheer unadulterated beauty of his stolen kiss with Juliet at the masquerade ball simply melted my heart. Victoria Appleton brought a stunning and goddess like beauty to Juliet, with a performance that was all about purity and a loving heart. Her childlike devotion to a boy she hardly knew was made the more believable with the portrayal of a Juliet who willingly gives her heart to her Romeo. The final scenes as both realise they have lost each other were accentuated and heightened by the soul wrenching delivery of Shakespeare's words. Peter Martin's delivery of Friar Lawrence,who's desperate but flawed plan to re unite Romeo and Juliet met with ruin, wonderfully counterbalanced the reckless love of two children who simply had no chance of beating the odds. His scenes with Romeo at the news of his banishment added a much needed balancing and reason to the production and were astutely performed. I have never enjoyed a portrayal of Juliet's nurse quite like Sarah Dorsett's in this production. Her baldy and earthy, but at the same vulnerable, almost needy, performance provided many of the lighter moments. The bold move to voice the Nurse with a broad Yorkshire accent was intensely risky and some may find the delivery hard to follow but, for me, it underlined the characters worldly wise experience and Dorsett is a delightful and talented actress. It would seem that Barnsley to Verona is very much part of the Grand Tour but methinks they got a bit lost! This is, after all, an International production and I find it bemusing that some reviewers would find the portrayal of characters from Italy with multi national accents in a negative light. What do you expect? Clipped and crisp British accents? Oh yes, because that's so much more believable for a play set in Verona isn't it!! I absolutely loved Teo Gwynne-Evans and Blazena Kovalikova as Lord and Lady Capulet. With the latter's portrayal one of the coldest and manipulative of portrayals. Her casual and stony disregard for her daughter's situation was a wonderful interpretation of the original scripting. Deepu James and Aisha Kent were equally engaging as Lord and Lady Montague and the two couples despair and grief, as the fruits of their pointless feud are made known, were expertly conveyed. Edward Haines is suitably foppish as the uninspiring and emotionally immature Paris, he provides Victoria Appleton with opportunity to deliver her character's disinterest with a force that is devastatingly effective. 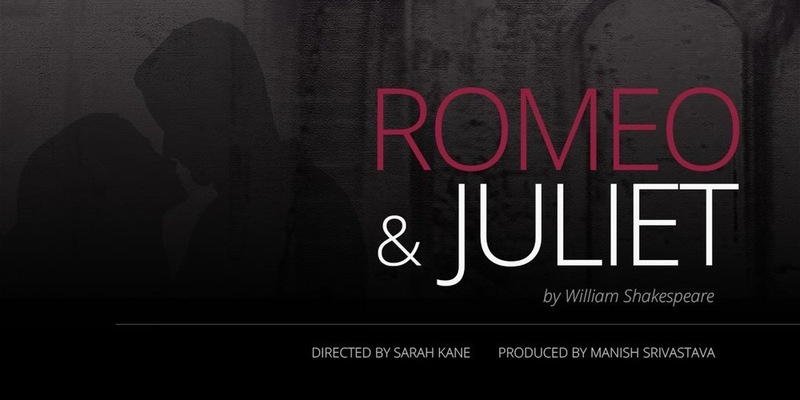 As Director, Sarah Kane has delivered a production of Romeo and Juliet that is effective and impressive with the staging not overwhelming or distracting from the central roles of Romeo and Juliet. I do have one issue with the production though and that is the bed that features prominently throughout Act 2. As the audience are allowed to re-enter the auditorium, Juliet is on stage and sitting up in a bed that is now occupying the centre of the stage. I cannot deny that this unexpected visual really did surprise me but, sadly, it was not without its drawbacks. The bed is only relevant in the scenes when they are set in Juliet's boudoir and so it had to be moved to the back of the stage when it wasn't required. For me, this was a decision that delivered a distraction that was hard to ignore as the bed was bolted into place and then unbolted again. For example, the only moment of intimacy that Romeo and Juliet share together was also shared with the two members of cast who had to move the bed into place. This inevitably jarred the audience and, worse, caused many around me to laugh. Sadly, this reduced the powerful emotion that was being conveyed during an intensely pivotal juncture. Another issue was that the bed also doubled as the final resting place for Juliet in her family's mausoleum. A simple black cloth draped over the bed would have made it far more believable rather than the fluffy pillows and quilt! Staging of the bed at the left or right of the stage would have meant the distraction of mobile bed noise and moving was not an issue and I have to say that the crucial feeling of inevitability and travelling ever close to their deaths was somewhat disrupted. Having said that, I cannot praise the cast highly enough as, to move my mindset from hatred to enjoyment with a play that has irritated me for more years than I can remember, is an incredible achievement. Once again PerformInternational have delivered a production that will excite and engage with audiences and has impressed me with the sheer talent showcased by the cast. 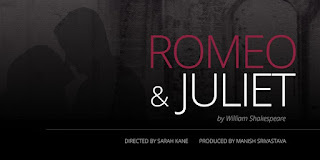 Romeo and Juliet is running until 11th June and I would urge you to book tickets. Click here to see performance dates and book your tickets.